Taking its name from Walt Disney’s working title for Disney World in Florida and opening with Celebration by Kool & The Gang – a reference to Disney’s rather strange Stepford Wives-esque town. The Florida Project trades heavily on the irony of the film’s characters living a near destitute lifestyle in the shadow of a giant corporate theme park built on the idea of a magical escape. The Florida Project is a phenomenally beautiful film to look at. 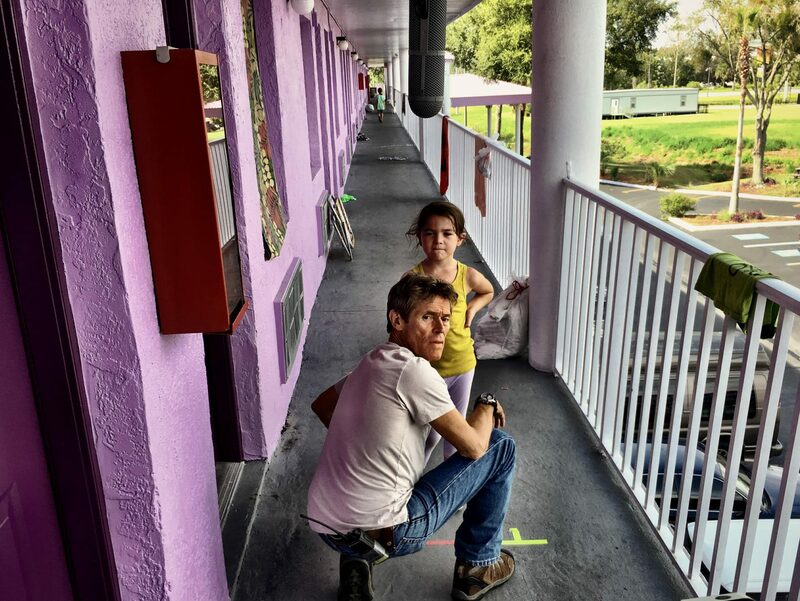 What’s so remarkable about The Florida Project though, is the way in which director Sean Baker chooses not to wallow in the difficulties that the film’s characters face. They’re there and we understand them, but they are a part of their lives, not what defines them as people. Having fun and laughing is also an incredibly important part of their lives. It’s a deeply human approach from Baker and one that relies on a great deal of empathy. Baker’s approach is always one in which subtly is paramount, allowing you to intuit what characters are feeling and what exactly is going on, something that allows the empathetic bond of an audience with the characters to grow into something complex and intense. Something that is all the more important when characters behave in ways that could be seen as ‘wrong’ or difficult to relate to. This bond with the central characters is all the more effective thanks to Baker’s choice to frame – both narratively and visually – the film from the point of view of children. Focusing largely on the antics of a young girl named Moonee (Brooklyn Prince) – although her mother, Halley (Bria Vinaite), other children, and hotel manager Bobby (Willem Dafoe) are also all important characters – Baker and cinematographer Alexis Zabe frequently place the camera at Moonee’s eye height, even occasionally when she’s not in the scene. It’s effective and is representative of how deeply Baker has clearly thought about how important his visual approach to the film is. One scene in particular shows how remarkable this sort of approach can be and the confidence with which Baker follows through. Moonee is in the bath and we see a shot of her playing, the sounds of a hip hop radio station playing from a phone in the background. Into the scene bursts a man. Someone that we understand is perhaps a client of her mother’s. The camera stays on Moonee though and never leaves her face, as she gets a little scared and once he’s left, perhaps a little confused. It’s tender, emotional and incredibly personal filmmaking, and it works in such an incredibly powerful way. Baker made a name for himself with the famously shot-on-an-iPhone film Tangerine, which was bursting with energy and colour both visually and narratively, and The Florida Project sees him switching to 35mm, albeit with a seemingly crucial digital intermediary stage – colourist Sam Daly deserves a name check here – and the results are stunning. The Florida Project is a phenomenally beautiful film to look at – a saturated rainbow aesthetic dominates every scene – but this, as with everything in the film, is done with definite purpose. The characters in The Florida Project live in The Magic Castle and Future Land, two run-down motels near Disney World, that are garishly painted and named in order to trade on the nearby tourism. In one particularly amusing scene a couple on their honeymoon arrive, thinking they’re booked into a Disney hotel, and are very disappointed indeed when they realise their error. The bright colours also contrast with the rather darker aspects of the characters’ lives. But it’s not all about irony; the colours also pop with the same kind of vibrancy as the characters do as they relax and enjoy themselves. Moonee may not have access to the theme park, but her playground is all around her, and it is her sense of wonder and ability to find magic – and mischief – in her somewhat bleak everyday life that gives the film so much raucous energy and sense of joy. Part Little Rascals, part Dardennes, Moonee and her mother’s day-to-day activities are so engaging and the characters so richly drawn, that I felt like I could easily have watched another ten hours of The Florida Project. The characters in The Florida Project feel so incredibly real too – a testament to the way in which Baker constructs the world, but also the incredibly raw performances of all those involved. And in the film’s more upsetting moments, for all the joyousness, we do see the sadder realities inevitably catch up with the characters – almost feeling like we can reach out and touch them. And all you want to do is hug them. Show some of the compassion and empathy that society so rarely seems to offer those in need. A thrilling, candy-coloured, rapturous, dizzyingly wonderful but utterly heartbreaking experience, The Florida Project is vital and special in so many ways. The kind of film that reminds you of why you go to the cinema. This entry was posted in Reviews and tagged Drama on May 26, 2017 by Craig Skinner.